In 1913, the famous botanist and explorer Joseph Rock, wrote about the “striking flora” of the dryland regions of Ka`ūpūlehu, neighboring Pu`u Wa`awa`a and other leeward regions throughout the islands. That is where he found “the richest in species as far as tree growth…” during his botanical surveys. The difference in the dry forests of today, compared to those of 1913, is staggering. Less than 100 years later, 90% to 95% of dry forests had disappeared. More than 25% of the species of these ecosystems are on the Federal endangered species list. Instead of expanses of dryland habitat, today there are only scattered remnants. The surviving plants, animals and insects cling to a precarious existence. Hawaiian dry forests have sadly befallen the fate of tropical dry forests globally, i.e. most have been destroyed as a result of direct or indirect human activities. For native people of the region, these plants and land were considered family or `ohana. The ancient Kumulipo creation chant reveals a complex relationship and dynamic continuum between people, and things of the skies, land and ocean. 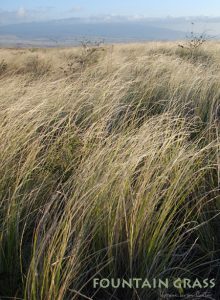 Within the Kumulipo, plants of the uplands have ocean counterparts, such as the dryland Alahe`e (Walahe`e), Wiliwili, `ūlei, Piko and Kauila (Uwila), and Maile seedling (Kuhonua). The ancient Hawaiian conservation management system of Kapu or restrictions to protect scarce resources is no longer in place. However the foundation for that thinking is still valued by many today, who believe the highest relationship with these rare grandparent or kupuna trees, has become the spiritual guidance and comfort that is offered by their living presence—and we should mālama or care for them as with any beloved elder. It is deeply believed to “take care of the land and the land will take care of you”. What is a dry forest in less poetic terms? Dry forests annually receive less than 50 inches of rainfall and are most often located on Hawaii’s dry, leeward coasts to mid-level elevation where rainfall is far less. 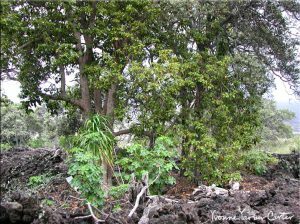 However, dry forests are uniquely diverse and on the Big Island, are also found in Puna and Ka`u as well as at high elevations, such as the palila habitat and māmane forests of Mauna Kea. Native plants, insects and birds once lived in prolific dry forests, thriving in a dynamic, rich bio-diverse environment that offered balance and bountiful treasures to be cared for and used by Hawaiians. What grows and lives in the dry forest? 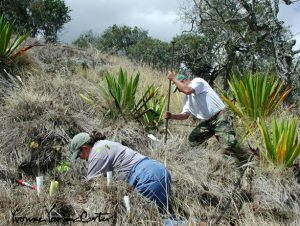 More than 100 native plant species grow in dry forests, including the endangered kauila, uhiuhi, koki‘o, ‘aiea and halapepe trees. More than 25 percent of Hawaii’s endangered plant species are found in dry forests. Birds, such as ‘amakihi and the rare palila (an endangered Hawaiian honeycreeper) are also found in dry woodlands. A key dry forest seed disperser, the ‘alalā (Hawaiian crow), previously existed only in captivity and was recently released back into the wild in a native forest suitable for its release, health and proliferation. The rare and endangered `O`kai (Manduca blackburni) or Blackburn’s sphinx moth also makes its home in this habitat. What happened to Hawaii’s dry forests? Land development and deforestation, wildfires, invasive species (including invasive plants, animals, insects and fungal diseases), grazing by ungulates (goats, sheep and cattle) and seed predation by rodents have all contributed to the degradation and fragmentation of Hawaii’s dry forests. About ninety-five percent of these forests have been destroyed. And many experts estimate less than three percent of the remaining habitat can be considered healthy forest remnants. How are dry forests restored? Restoration of dry forest habitat is a labor-intensive project that usually begins with installation of fencing to keep out ungulates that graze on natives. Next invasive species such as fountain grass and woody species are eliminated, and then native species are planted and often irrigated for a time until they take hold. As the natural system recovers and begins self regeneration, the maintenance work becomes less intensive. Firebreaks, rodent control and maintaining fences to prevent ungulate grazing are also critical to protect a recovering forest. While better techniques and methods are evolving to more efficiently care for dry forests, they still require a great deal of care. What is the common grass I see throughout the lands of leeward Hawaii? Fountain grass (Pennisetum setaceum) is an introduced ornamental grass common to the drier leeward areas of Hawaii Island. This highly invasive species suppresses native vegetation and fuels dangerous wildfires that are devastating to native ecosystems. Maintaining firebreaks is important to restoration efforts and benefits everyone. I’ve heard that native rain forests are very important to watersheds. Do dry forests play a similar role? Where are some dryland restoration projects? Pu‘u Wa‘awa‘a, Ka`ūpūlehu, Waikoloa, Kawaihae Uka, La`i `ōpua, Palamanui, Kaloko-Honokohau, Volcano National Park, Mauna Kea, Ka`u and Manuka have remnant dry forests. These public and private lands represent a remarkable diversity of historical, natural, cultural, scientific resources; and a rich history of ancient and contemporary human use. Nāhelehele advocates for restoration of these and other dryland ecosystems. 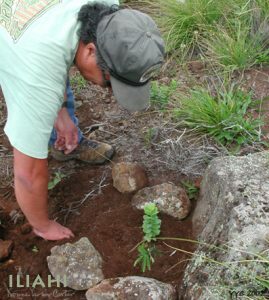 Other islands also have dynamic restoration efforts such as the Auwahi project on Maui, and the efforts in the Wai`anae Mountains of O`ahu. Dry forests play a crucial role in the cultural health and traditions for Hawaiian people. Dry forests are the exclusive home of many endangered native plants, birds and insects. When these forests thrive and their wildlife and soils thrive, a healthy biodiversity abounds, bringing natural harmony and balance between plants, animals and nature. By preserving native species, we preserve biodiversity and genetic information and open more possibilities for the evolution of plants and animals to thrive in future environments. Dry forests maintain and promote healthy soils by limiting both water and wind erosion. They also sequester carbon, produce oxygen, help to replenish drinking water aquifers, create cool micro-climates and provide many other ecosystem services necessary for life on the planet. More parts of the world are likely to become drier, given the effects of global warming, and the more we understand the dynamics and relationships of dry forest species, the better we will be able to cope with increased drying of the land.